Christopher Bell won Saturday’s Xfinity Series race in New Hampshire. 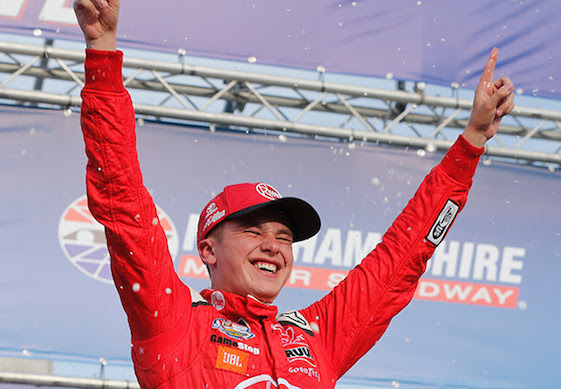 Christopher Bell won Saturday’s NASCAR Xfinity Series race at New Hampshire Motor Speedway. The victory was the second straight for Bell. To get it, he had to hold off former Cup Series champion Brad Keselowski. Bell led the field for a total of 93 laps, and after 13 lead changes, he led for the final time on lap 182. Bell grabbed the top spot from Keselowski on a restart on Lap 183 of 200 and kept the 2012 Monster Energy NASCAR Cup Series champion behind him the rest of the way, though Keselowski got within three feet of the rear bumper of Bell’s No. 20 Joe Gibbs Racing Toyota with three laps left. (2) Christopher Bell #, Toyota, 200. (1) Brad Keselowski(i), Ford, 200. (3) Ryan Preece, Toyota, 200. (5) John Hunter Nemechek, Chevrolet, 200. (14) Matt Tifft, Chevrolet, 200. (8) Brandon Jones, Toyota, 200. (7) Justin Allgaier, Chevrolet, 200. (10) Elliott Sadler, Chevrolet, 200. (4) Cole Custer, Ford, 200. (11) Austin Dillon(i), Chevrolet, 200. (6) Daniel Hemric, Chevrolet, 200. (24) Ryan Reed, Ford, 200. (13) Ryan Truex, Chevrolet, 200. (16) Kaz Grala #, Ford, 200. (17) Ryan Sieg, Chevrolet, 200. (19) Michael Annett, Chevrolet, 200. (15) Austin Cindric #, Ford, 200. (18) Jeremy Clements, Chevrolet, 200. (12) Johnny Sauter(i), Chevrolet, 199. (25) Tommy Joe Martins, Chevrolet, 199. (34) Chad Finchum #, Toyota, 198. (22) Joey Gase, Chevrolet, 198. (21) Alex Labbe #, Chevrolet, 198. (29) Spencer Boyd #, Chevrolet, 198. (9) Tyler Reddick #, Chevrolet, 196. (20) Ross Chastain, Chevrolet, 196. (35) Vinnie Miller #, Chevrolet, 195. (27) David Starr, Chevrolet, 195. (37) Bayley Currey(i), Toyota, 190. (40) Angela Ruch, Chevrolet, 188. (39) Mike Harmon, Chevrolet, 182. (28) Garrett Smithley, Chevrolet, Accident, 176. (30) Donald Theetge, Chevrolet, 172. (33) Josh Bilicki #, Toyota, Ignition, 165. (26) BJ McLeod, Chevrolet, Engine, 130. (23) JJ Yeley, Chevrolet, Brakes, 113. (38) Carl Long, Chevrolet, Brakes, 62. (32) Timmy Hill, Toyota, Vibration, 57. (36) Morgan Shepherd, Chevrolet, Brakes, 32. (31) Jeff Green, Chevrolet, Brakes, 22. Average Speed of Race Winner: 99.616 mph. Time of Race: 02 Hrs, 07 Mins, 27 Secs. Margin of Victory: 0.416 Seconds. Lap Leaders: B. Keselowski(i) 0; C. Bell # 1-48; R. Preece 49; B. Keselowski(i) 50-53; R. Preece 54-57; B. Keselowski(i) 58-83; R. Preece 84; B. Keselowski(i) 85-93; E. Sadler 94-119; C. Bell # 120-145; B. Keselowski(i) 146-163; D. Hemric 164-166; B. Keselowski(i) 167-181; C. Bell # 182-200. Leaders Summary (Driver, Times Lead, Laps Led): C. Bell # 3 times for 93 laps; B. Keselowski(i) 5 times for 72 laps; E. Sadler 1 time for 26 laps; R. Preece 3 times for 6 laps; D. Hemric 1 time for 3 laps.